Next morning, nice and dry again, it was time to keep heading north on our way to Scotland. Given it was a few hundred miles away, we decided to spend a few days making our way. Kate had a plan, which was to make our way to Bamburgh, about 200 miles away for a couple of evenings, where we could checkout the Northumbrian coast and visit some historic places along the way. So after a big brekky it was in the car and away! We didn’t get far though, making a quick stop by the church in Chesterfield for a quick photo. The pic probably shows why we wanted to make a quick stop. 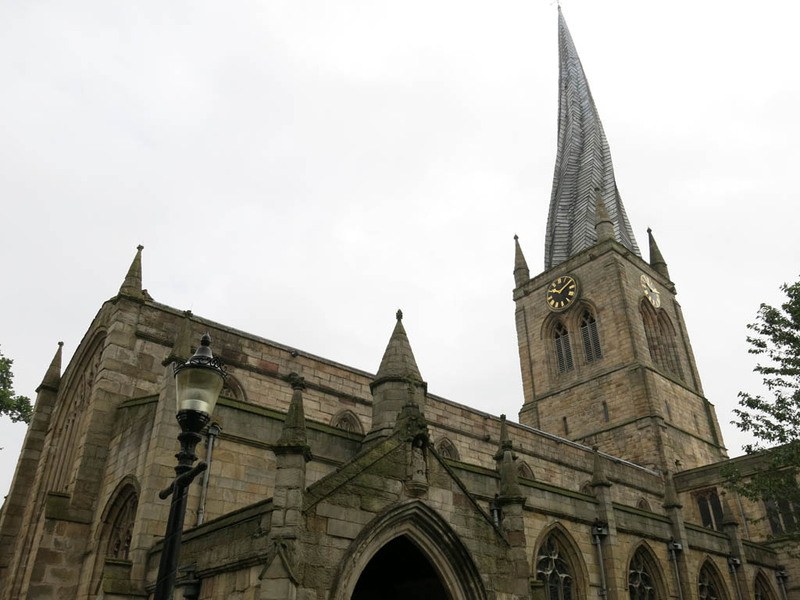 Nope, that is not a weird photo illusion… the spire really is that wonky. It looks quite cool and it amazing that a church would allow something so distinctive to be built. But they did, and as a result we made a visit. With photo done, it was on the M1 and heading north. There wasn’t much to report on the way. We got to see many of the wind farms that are dotted all over the UK. Why we haven’t gone with them at home I will never know. On our travels we also made our way past the city of Newcastle. Although we didn’t go into the centre, we did see their main attraction from the motorway. The Angel of the North is a public art work that overlooks Newcastle and the A1 motorway. I only got a quick chance to snap a pic out the window. It is the second time I have seen it from the motorway, and yet still don’t feel compelled to get closer. I’m sure it is more impressive up close. We kept on trucking, but not to Bamburgh, rather to our main destination, Alnwick Castle. 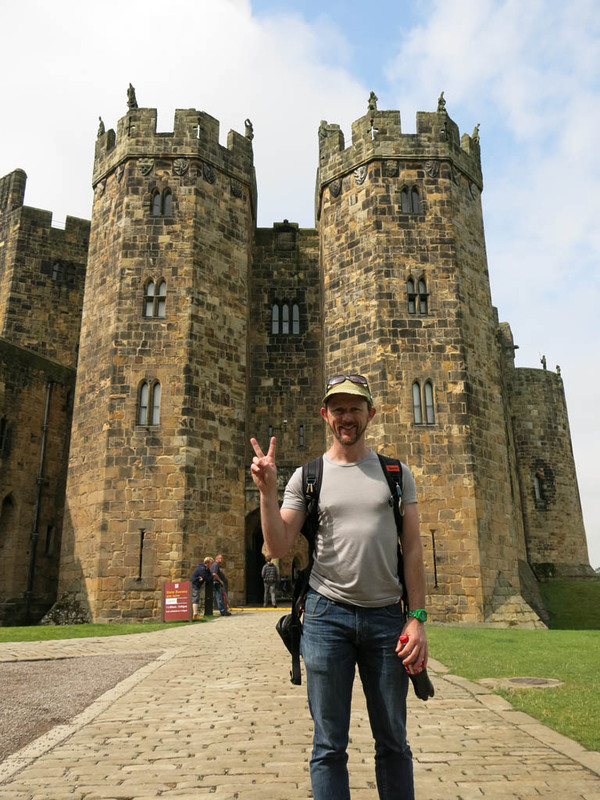 About 1000 years old, Alnwick Castle is the second largest inhabited castle in the UK (behind Windsor Castle) and is in amazing condition. In fact much is still intact, and as a result is still a main residence for the Percy Family, as well as the site of many films and TV programs (one of which, apparently Downton Abbey) was being filmed when we visited. The biggest drawcard though would be as home of Hogwarts in the first two Harry Potter films. So rather than just leave it as a castle to casually wander, it is full of tours and costumed characters. Thankfully not too much, so it still retains the dignity of a historic site. But we still took the opportunity to get to see all the spots where Harry and co got up to shenanigans. The folk obviously didn’t waste the opportunity to have their own Harry Potter characters wandering around. 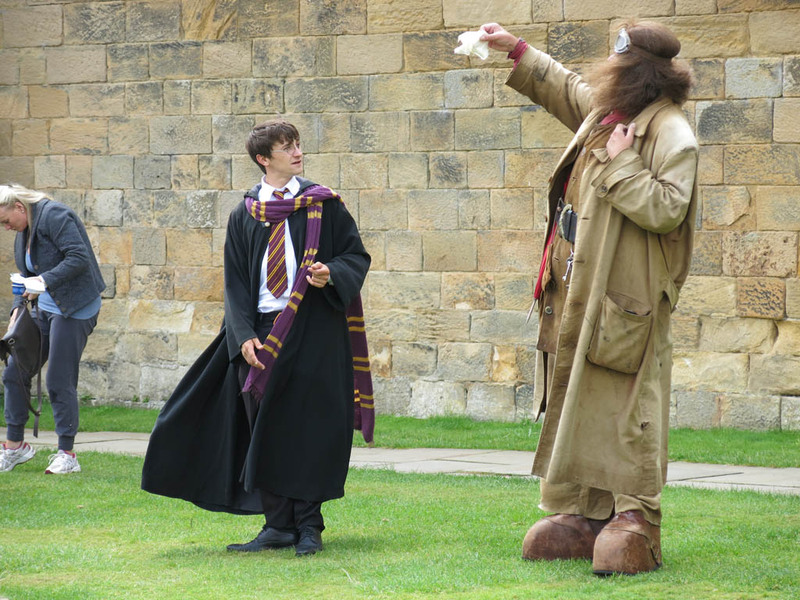 In fact there was a not too horrible Harry and Hagrid entertaining the crowds. The other concessions to the crowds was to have some some more entertaining things for the kids. One was the chance to dress up like knights/princesses/loons. Of course we took the opportunity to do so, what did you expect? As well as this there was the Dragon’s Quest, slightly kitschy, slightly dodgy, “spooky” area. As we made our way through dark corridors and mirror halls, things would jump out at us. I will admit, that something got both Kate and I at different times, but it was a bit lame. Thankfully it was one of the few things to detract from the dignity of the castle. But of course it was still kinda fun. The rain began to settle in, so we took that opportunity to finish up. A quick drive and we were in the seaside town of Bamburgh, our home for the next couple of nights. 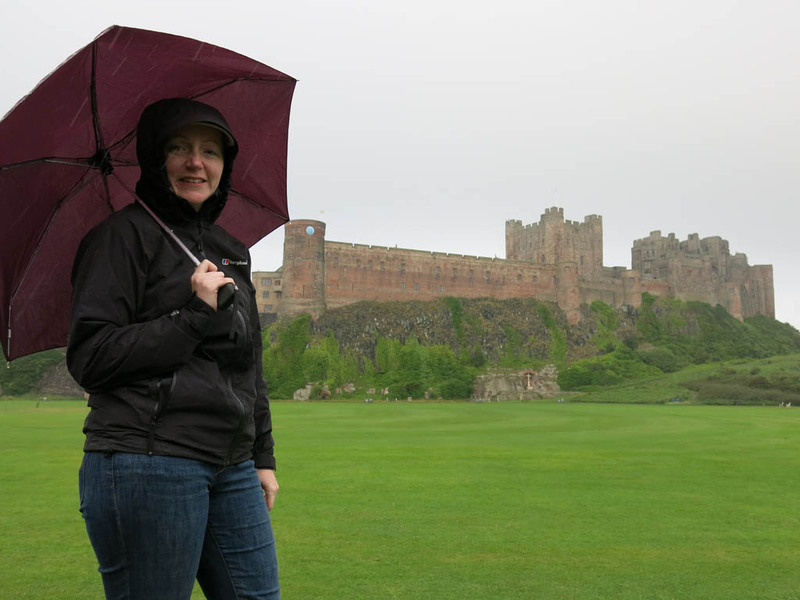 Even though it was pouring, we decided to wander to the nearby beach and Bamburgh Castle. Bamburgh Castle is also owned by the same family as Alnwick, but sadly we didn’t have a chance to pop in and say hello. Rather we just wandered about. It looked quite amazing and dramatic on the hill overlooking the sea. It was a tad windy and rainy down on the beach. Hopefully I do get a chance to have a dip in the next couple of days!